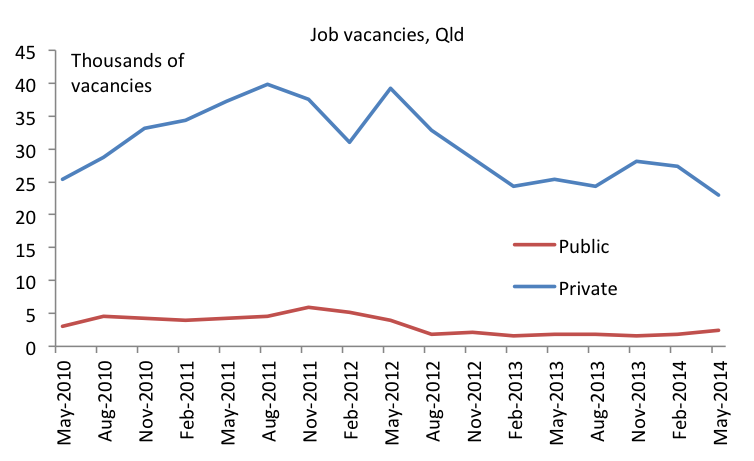 Job vacancies data released by the ABS yesterday suggest the Queensland labour market will remain relatively weak over the next few months at least (see chart above). The data are also consistent with Queensland Treasury’s forecast in the Budget that unemployment will remain at around 6% in 2014-15. Given the lacklustre labour market, it is even more important to reform regulations that are restraining opportunities for trade, one egregious example being restrictions on retail trading hours. The grocery giant has told a Productivity Commission inquiry that Queensland’s trading hours are too restrictive and complicated and costing the state’s economy tens of millions of dollars a year as well as local jobs. “Trading hours in Queensland are regulated by (an Act that) runs over 57 pages plus eight pages of regulations,” Woolworths said in its submission. “On Saturdays, shops in southeast Queensland must close by 5pm but in inner-city Brisbane by 5.30pm, in the city heart of inner-city Brisbane by 7pm, in New Farm by 9pm and in the Gold Coast tourist area by 10pm. Woolworths highlighted 20 regional towns across the state where it was prevented from opening on Sunday. This entry was posted in Labour market, Macroeconomy, Retail trade and tagged qld, queensland, retail, retailtrade, toowoomba, tradinghours. Bookmark the permalink.